Attention Fans and Supporters! Announcing Our Third Snibbles Book -- Just Publisher 2014. Attention Fans and Supporters! By Popular Demand. Announcing Our Third Snibbles Book -- Just Published 2014. Contains Over 50 New STEAM Activities Designed to Stimulate the Creative Thinking of Gifted and Advanced Students. *Some of these Objects are: Ball Assortment, Buttons, Clock/Wristwatch, Cotton balls, Food Assortment, Games, Handkerchief, and Hot Chocolate. 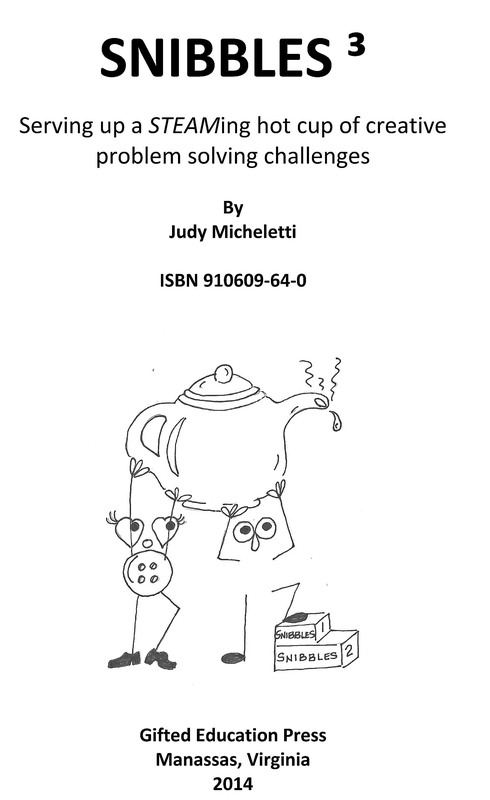 Order SNIBBLES 3 from Amazon.com or Directly from Gifted Education Press. How to Order: Either by sending a check or purchase order (see below) directly to Gifted Education Press or via Amazon.com. SEND YOUR CHECK OR PURCHASE ORDER TO: GIFTED EDUCATION PRESS; 10201 YUMA COURT; P.O. BOX 1586; MANASSAS, VA 20108. TELEPHONE -- 703-369-5017. Email: mfisher345@comcast.net ALL ORDERS UNDER $50.00 MUST BE PREPAID. Or Order through Amazon.Com. THANKS! Alternative Ordering Method: This is the quickest and most economical way to order -- via PayPal. You will receive a PDF version of this book sent to you as an email attachment. Click Here for More Information. Return to Gifted Education Press Home Page.